Enjoy the sunny and breezy beaches of the tyrrhenian coast of Massa Carrara, set in the breath-taking scenario of the Apuan Alps, relax and have fun during your holidays in Tuscany; just by crossing the regional border, you can discover Liguria and the most beautiful sea resorts of the Ligurian coast, such as: Lerici, Porto Venere and of course The Cinque Terre. The coast of the province of Massa Carrara is known as Riviera Apuana, and covers a 20-kilometre stretch of coastline, from Cinquale di Montignoso to Marina di Carrara. The sandy beaches offer both private beach resorts and free beaches with lifeguard, refreshment stands, toilets, and beach umbrella, deck chair and sun bed rent service. Our beaches are perfect for anybody, especially for families with kids. The temperatures are mild and it is breezy, and that turns swimming and getting tanned into an even more pleasant experience! This area can offer you the privilege of swimming and enjoy the sea, while admiring the Apuan Alps! If you have your furry friend with you, head to the dog-friendly Bau Bau Beach Partaccia, just 10 minutes away from Camping Calatella in Tuscany in Marina di Massa: dogs are welcomed here. If you happen to visit Liguria as well during your holidays in Tuscany, you can’t miss the Cinque Terre, Lerici and Porto Venere. Let’s get to know these places better! The Cinque Terre comprise five villages: Monterosso, Vernazza, Corniglia, Manarola, Riomaggiore. Perched over the sea, their beauty is pure and shining as the light of five diamonds. Their numerous bays and coves represent the ideal stop after a boat trip: just cast anchor and enjoy the peace and quiet of the immensity of the sea. The Cinque Terre’s coastline is mainly rocky, but you can also lie down on the lovely small beaches among the cliffs. The National Park of Cinque Terre was listed as Wold Heritage Site by UNESCO in 1997. If you are fond of diving, you can explore its amazing seabed. Cinque Terre also means paths to traverse and villages to visit. La Via dell’Amore (The Way of Love) is well known all over the world: it is about 1 kilometre long and it connects Riomaggiore to Manarola, and it’s just one of the most romantic and unique experiences ever, especially for couples in love! A heads-up: the path was closed to the public in 2012 because of a landslide and it has just been recently reopened, but only a small stretch; if you don’t mind long distance walking, though, an alternative route can lead you to Manarola: the one-hour long “Via Beccara” path. 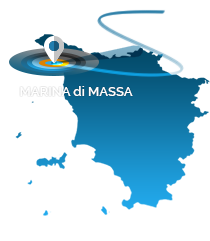 The Cinque Terre are easily reachable by sea from Camping Calatella in Marina di Massa thanks to a small boat service operating from Marina di Massa or from Marina di Carrara or by train leaving from the train station in Carrara-Avenza. You could also reach it by car, but it’s not the best option: it is quite difficult to find a parking spot there! The village Lerici is the gem of the province of La Spezia: overlooking the sea, loved by English poets such as Lord Byron, Percy Bysshe Shelley and by Mary Shelley, the author of the famous gothic novel“Frankenstein”, it is a lovely place featuring a castle and a long walk to the village of San Terenzo, where Shelley chose to live. On top, the castle of Lerici dominates the whole village and hosts the Palaeontology Museum and its interesting exhibitions and events. A breath-taking panorama can be admired from the terrace: discover the Golfo dei Poeti (The Poets’ Bay) and its astonish beauty. If you feel like sunbathing and swimming, the beach and the sea of Lerici are just the place to be! At night, though, Lerici is even more irresistible: don’t miss a stroll along the small port, lose yourself in the magical sight and sound of the sailboats all around. You can reach Lerici by car. Be an early bird, though: it will be easier to find a parking spot. Porto Venere, also known as Portovenere, is an astonishing Ligurian village in the province of La Spezia and, just like Lerici, it overlooks the amazing Golfo dei Poeti, especially where the three islands of Tino, Tinetto and Palmaria stand out. Only the latter one is partially populated. Porto Venere is like the setting of a fairy tale, with its typical Ligurian houses in pastel colours. Lord Byron fell deeply in love with this charming and gorgeous place, and with its romantic flair. Here is where he composed many of his most beautiful poems, inspired by the sea and by its surrounding landscape. One of the grottos in Porto Venere was named after this English poet: the fabulous Byron’s Grotto, as beautiful as the other well-known grotto, called the Grotta Azzurra. Porto Venere also features an enchanting Romanic church, the Church of San Pietro, on top of a cliff overlooking the sea. Porto Venere is easily reachable from Camping Calatella in Tuscany, Marina di Massa, by boat or by bus from La Spezia; coming by car, on the other hand, is not the best option. Food in Cinque Terre, Lerici and Porto Venere will just delight you: typical Ligurian fish dishes and much more. If you are a wine lover, do not miss the Cinque Terre DOC, especially the refined Sciacchetrà.